In order for students to be successful in an environment where they are empowered with their own learning choices, they need to have the skills to be successful. I believe that explicitly teaching and assessing these skills should be the focus of what we do in school. I teach grade 3 at ISHCMC and just as our colleagues in Studio 5 have been experimenting with different ways to give students agency in their learning, we have been doing the same thing. How do we prepare students for the Studio 5 model? How do we teach them the skills they need in order for them to be successful? We have been experimenting with focusing a unit on a particular set of skills, explicitly teaching and assessing them. Then for the final part of the unit, opening it up for the students to put their new skills to the test. An example of this was our WWAITAP unit where we explicitly taught research skills through the content of explorers and then students used their research skills to find out about various topics that interested them. Always coming back to the skills, not the content. Most recently, students practiced their self-management skills by planning and organizing their week. We had a list of “must-dos” that students needed to accomplish. How they organized their time, where they worked, and how they decided to complete their tasks were up to them. No matter how they decided to work, everyone agreed that by Friday afternoon, all the tasks would be completed. 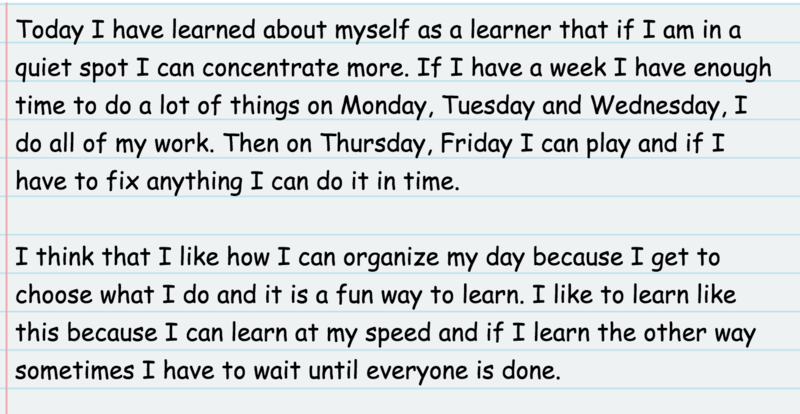 Students reflected every morning about the specific things they wanted to complete for the day and if they were on track for getting everything done for Friday. Then every afternoon, they reflected on their accomplishments, frustrations, and changes, if any, they would make the next day. This sparked some amazing discussions about how people work in different ways. Some liked to get everything done in the beginning and have free time at the end of the week. Others liked to mix in playing with work and still, others preferred to play earlier in the week, needing the pressure of the deadline to work at the end. I thought it was a really successful week and most students found the time quite motivating and fun. Interestingly, some actually preferred the more standard approach. Those students tended to be the ones who do not have as much self-control and need to develop their self-management skills, as opposed to being told what to do. It is those students who would benefit the most from this approach. Of course, this is still a work in progress. We are still experimenting and exploring how to specifically teach and assess these soft skills, prepare students for Studio 5, and for their futures. Any ideas or thoughts would be appreciated! This is a follow on from my previous post titled ‘Student Agency in Grade 2’ where I tried to establish what agency was and what it looked like in a grade 2 classroom. I have really noticed this year just how much my students value responsibility. They thrive when given the chance to be in control of what they are doing and having their opinions and ideas help guide the learning. I’m still working at developing this but I feel very happy when seeing the difference it has made to the students. Since the previous post our classroom changed. My approach to working with the students changed. And as I suggested in my last post, I did literally bring down the boards. Because, why not? (the maintenance team at school may have some strong answers to this question. But I’d like use this opportunity to pass on my thanks to Micha, Tony and Rocco for all their help.) The children also have a little step ladder which we use when adding their connections to our connection board. A contentious piece of equipment in a place very much concerned with health and safety, but we trust each other in grade 2 so all is well. Sometimes you need reminding of best practice. We read, talk with colleagues and share ideas, but sometimes the key ingredients of teaching can become routines. It isn’t that we don’t include them in our teaching, but we can very easily fall into the trap of routines and not do it justice. Recent PD from Kath Murdoch @kjinquiry broke my routine and this was when I decided to create ‘The Wonderwall’. Simple self-adhesive whiteboard rolls quickly turned the blank wall in to another part of the room strictly owned, managed, and controlled by the students. And the results have been fantastic. The ‘planned’ unit from previous years didn’t include many of these questions, which left me thinking what a tragedy it would have been if we’d stuck to the ‘plan’ instead of leaving it all behind and re-doing the unit, a truly student led unit. We are only in week 2 but the students are already taking over the room with plants, and inquiry time is in full flow. Just goes to show what some simple design changes that support agency can do. Child A: It’s great, much much better than before Mr Jeffrey. Child B: Why didn’t you always do this though? Were you not a good teacher? Child C: It is better than before. Now you can choose what things to do and before it was boring. Child D: When we get to choose, I like it more. Because before if I wanted to do the drawing first and you made me do it last, then I did bad in the other things on purpose because I just wanted to do the drawing. As well as making me laugh, it showed me that giving over a little bit of choice can make all the difference. I work with Grade 2 and so agency will look different than it does in Grade 5, and I’m not there just yet with implementing some more drastic timetable changes. But preparing them for this eventuality and making sure they are ready for this environment are things that I can do right now. So, I’m trying to provide more opportunities for students to have ownership, choice, agency in their learning. If I was to give advice to anyone starting on this journey then just look at what you have planned for tomorrow and ask yourself the question “How much choice, input, agency do the students have in this?” And if you don’t like the answer, then tweak it. Nothing massive, no big bold statements, just small changes and then see what happens. That’s what I did and I like what I’m seeing. Finally, give over the room. You can still manage it, but listen to them. If there is anything you can provide that gives them responsibility, then do it. For me this is the first step to agency in the lower grade levels. It’s about fostering the necessary ingredients needed to make agency work later on: responsibility, trust, reflection, curiosity, connections, questions. In my teacher preparation program we were taught to comply with “best practice” for lesson planning as determined by the public sector of education. This meant extensive lesson plans created to ensure preparation by the teacher to engage students in learning specified content. Let me say that again…. Extensive lesson plans created to ensure preparation by the teacher to engage students in learning specified content. I was expected to know how to differentiate for diverse needs of all my students. I met this expectation by thoughtfully planning scaffolds, modifications and strategies for various student needs. For my first formal observation in student teaching my lesson plan for one 40 minute period was 8 pages long. I planned for what I was going to say, what students were going to say and do- the entire process of learning according to me. This sort of detailed differentiated lesson planning is considered best practice in many education circles. It’s actually what is expected in many teacher training programs and schools. With all the planning and focus on differentiating for content delivery, I left little wiggle room for students. There was no space in my plan for student questions, interests or any exploration of the concepts beyond what I knew or told them. And then came Ms. C’s feedback. Ms. C was my cooperating teacher who was graciously overseeing my development as a student teacher for 5 months. The beautiful part is that there is so much growth in pain. Ms. C ignited the fire in me to begin a transformational reflection journey- and for that I am forever grateful. What if instead of me doing all the work to plan completely structured lessons to deliver content, I spent more time understanding the learners and helping them understand the learning goal? Cue paradigm shift. My entire philosophy and purpose as a teacher began an instrumental change even before I was a “teacher”. As a teacher to be, I was becoming conditioned by a system to create perfectly structured learning experiences for students. Upon reflecting I was forced to consider exactly what I was taking away from learners by creating those very learning experiences. The answer was pretty blatant. When I was doing all of the work in planning, I was also doing all of the learning. I believed in planning and the necessity of differentiation. But, I also wondered… if I create all the steps for learners to be successful, where is the learning process? Will students be able transfer the scaffolds I create for them to different scenarios? 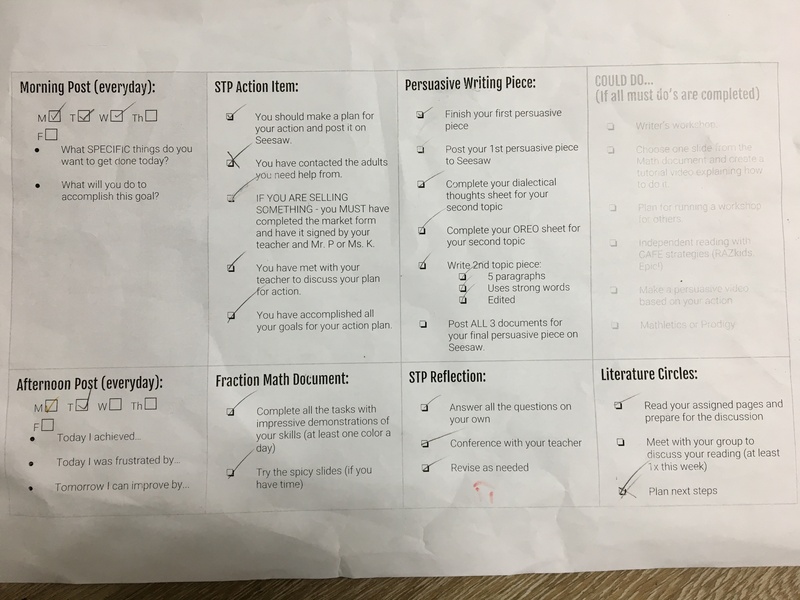 In my quest to answer these questions I found that when the teacher does the cognitive work, finds the resources, and plans the steps for learning- students are walking down a predetermined path…. as followers. How egotistical is it to think that all students will succeed with my scaffolds, learning process, and differentiated plan… for them. Meaningful learning is a process that isn’t perfectly structured or completely planned for. It involves learners setting up the process through which they learn. Can they do this naturally? Not that I’ve seen… without support. Teachers support by setting up processes with students for them to learn, not by processing learning for students to follow. This is where my journey began. From followers to learners. It begins with the teacher; a mindset shift.